With this set, you get 2 ounces of each seasoning mix and 5 ounces popcorn mix, NO SALT (Why pay for the salt?!) These are my favorite party recipes combined in one box and at no extra cost to you. I do the shopping and all you have to do is order although if you want to choose your own four blends at (https://www.etsy.com/shop/Souperspices?ref=seller-platform-mcnav§ion_id=6633935) please do in my special order box or in notes at checkout. 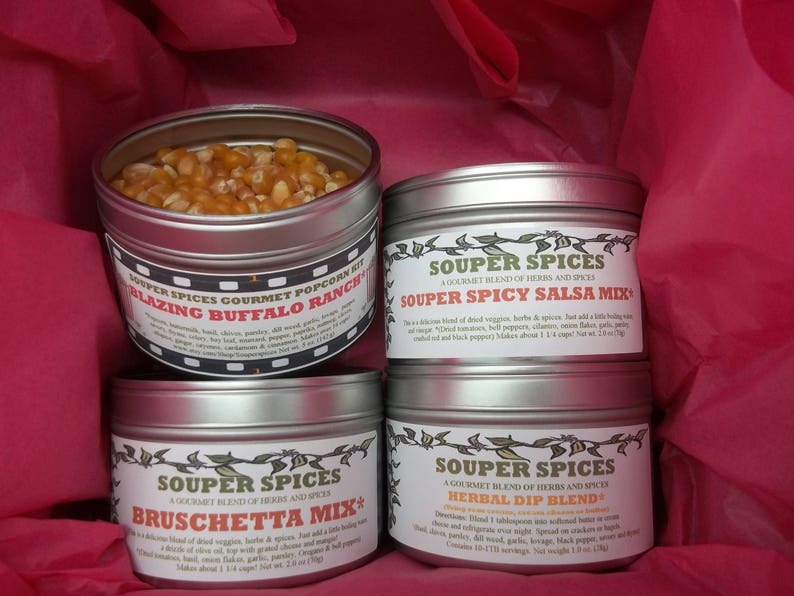 My Souper Spices Party gift set is the perfect gift for the person that has everything. It's a deliciously unique gift for friends, families and a great housewarming gift! RECIPE: Melt 1-4 TB of butter: Add 1- 3 teaspoons of spice blend. Salt to taste and toss. *HERBAL DIP BLEND- Using milder herbs such as savory, basil and lovage make this a great dip for a party or family snack. 3 recipes! Basil, chives, parsley, chives, dill, garlic, lovage, pepper, savory and thyme. Have cheeses and butter at room temperature. Crush garlic & mix cheeses, butter and garlic. Add remaining ingredients, mix well. Pack into a container just large enough to hold the Boursin and store in refrigerator. To serve, bring to room temperature. *SOUPER SPICY SALSA-I don't know about you, but at the end of summer and closing of the cottage, I would clean out refrigerator and find 3 jars of unfinished salsa! This is what prompted me to to try my hand at making a dehydrated salsa. It is so nice to be able to go to the cupboard and find a package add water and vinegar and have it ready to serve in minutes. I love this on my quesadillas, burritos and scrambled egg wraps. Contains: Dried tomatoes, onions, mixed bell peppers, cilantro, red pepper flakes, cumin, crushed red pepper and black pepper.